These gigantic natural creations that float in the waters near Charlottetown, Southern Labrador in Newfoundland Labrador are stunning to see from above. This aerial shot lets one see how much of this iceberg is submerged under the ocean surface as it slowly melts after making its way into this bay. Aerial view an iceberg in bay along the coast of Southern Labrador near Charlottetown, Labrador, Newfoundland Labrador, Canada. 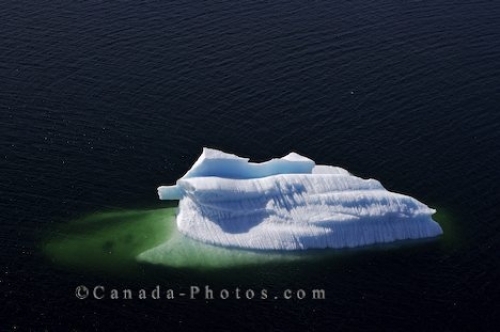 Aerial of an iceberg floating in a bay near Charlottetown, Southern Labrador in Newfoundland Labrador, Canada.